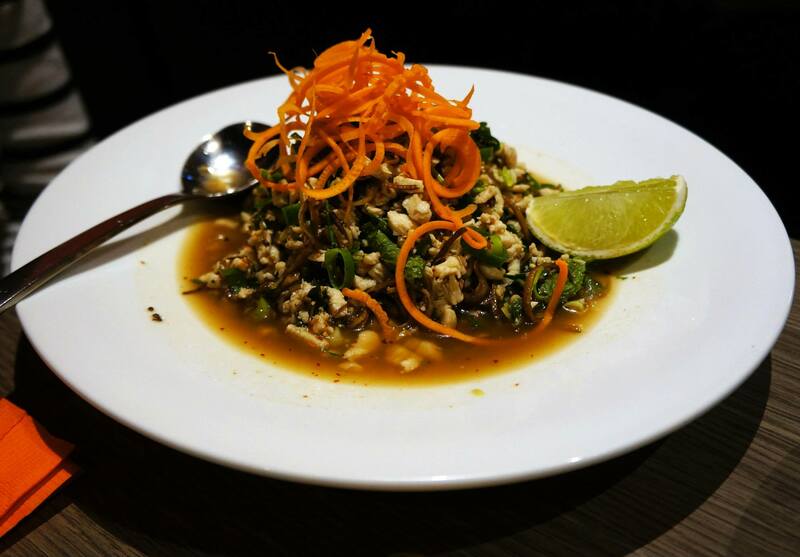 Maenam Lao & Thai is a new and very welcome addition to the main dining strip at Strathfield. On our usual hunt for some dinner at a Korean restaurant we stumbled across this place, apparently just when it had recently opened and decided to try it out because we had a craving for Thai. I really like that they’ve opened up where they have because Strathfield now has a bit more diversity and choice in restaurants. Since the restaurant has a fair amount of Lao dishes as well as Thai we decided to lean more towards the Lao food for something a little bit different. 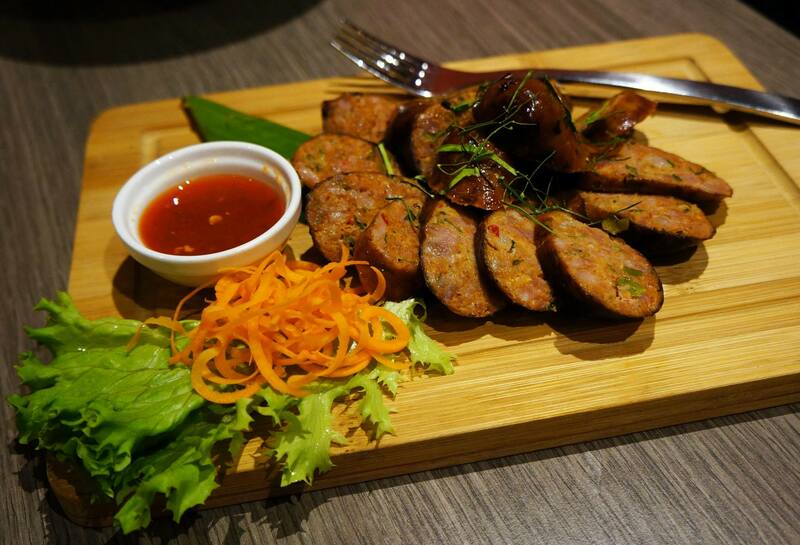 Our starter were Lao Style Sausages (above) which tasted amazing with the right amount of sourness. Home Thai do a similar kind of sausage which were also quite good but the ones at Maenam managed to top them in terms of taste and texture. Our first main dish was Gai Larb, it’s a Lao dish made from mince chicken and other ingredients such as roasted ground rice. My mother actually makes this at home and unfortunately Maenam will never top it in my eyes though they did quite a good job! The dish goes very well wrapped in fresh lettuce and lemon juice but in this case it was served with steamed jasmine rice which might have detracted from the dish a bit, it is however the best Larb I’ve had outside of home! Our second main for the night was something a little bit more traditional, we opted for a stir fry dish with pork and chose lemongrass chilli as the sauce. The sauce turned out amazing and the meat was cooked perfectly along with it, I can’t fault anything with the dish except the abundance of peas (I’m not a fan) that were littered all over it. Otherwise it was a very delicious dish and I especially liked the spiciness to it. 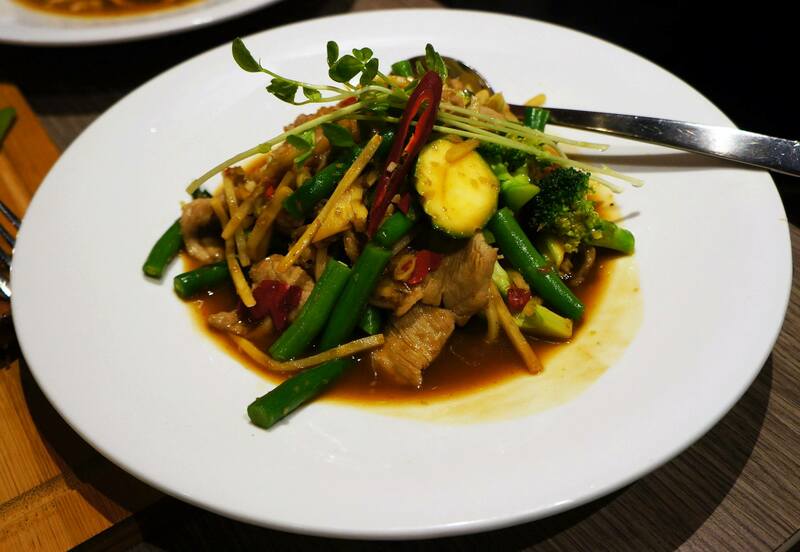 Maenam Lao & Thai does a really good job of bringing decent Thai and Lao cuisine to the Strathfield area, in fact it’s probably one of the best restaurants for its cuisine in the area. Overall though I believe other places in the CBD offer a better experience but also higher prices to match, Maenam is definitely a good visit if you live further out west and are looking for decent Thai/Lao food. Theres a Lao and Thai place in Strathfield. Cool! We may check it out. Hows the prices?. Not too bad at all, under $20 for most dishes? It’s more Lao style than the one in Newington for sure.